Size and cost were once a deterrent for wastewater treatment, but this is no longer the case. Reclamation of the sewage water for irrigation, laundry and sanitary water supply have made these systems very affordable and appealing to hotels, resorts and households by reducing the overall water consumption. LifeSource has been involved in developing small, cost-efficient systems specifically for the Caribbean and similar areas around the world. These systems are very basic in design to minimize maintenance. The modular design of these systems reduces the requirement of usual lift stations. 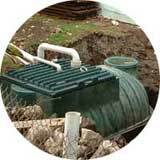 With no internal pumps and simple control systems these wastewater treatment plants are ideal for remote installations. Units sized from 250 gallons per day to 9,000 gallons per day make it possible to accommodate virtually any domestic or industrial sewage. Click Here to view some same projects.